“It’s for the kids.” Does anyone take this line seriously anymore? As a husband and father of four sons, my children are my life, the most precious gifts one can have. And that’s why my blood absolutely boils when children get exploited for corporate gain. Automatic ticketing cameras are being rejected all over the nation by voters. In 15 states, ticketing cameras have been banned. In 15 cities there have been local initiatives and in all 15 votes, the people have rejected the cameras by 60 percent-80 percent margins. But the people’s revulsion to ticketing cameras hasn’t slowed down the for-profit, out-of-state camera companies. They can’t stop because tens of millions of dollars are on the line. 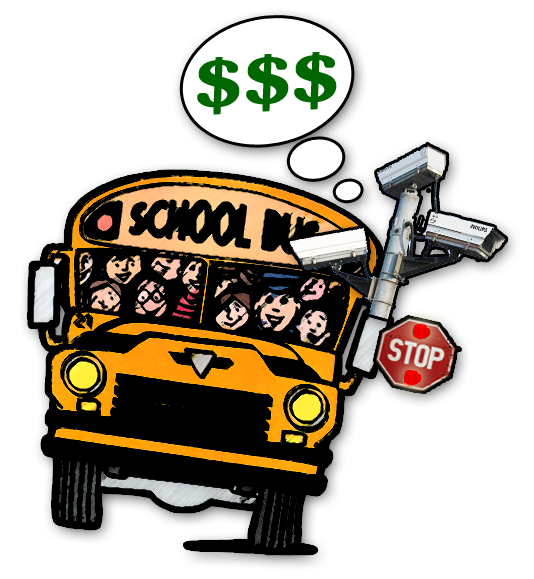 That’s why they have introduced a new product line: ticketing cameras on school buses. 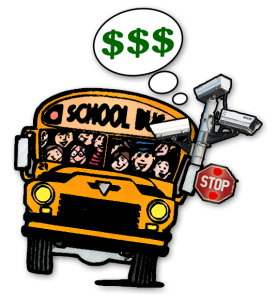 The same way cities are getting hooked on ticketing camera money, for-profit camera vendors want school districts to get addicted, too. It’s horrendous policy: The more lawbreakers there are, the more the out-of-state camera corporations profit, giving them a huge incentive to increase the number of lawbreakers. Camera vendors and governments then team up to modify the cameras and the laws to maximize revenue at the expense of safety. The unholy corporate-government alliance creates a disturbing, profit-driven, predatory enforcement program. Is there a huge safety issue when it comes to school buses? According to the National Highway Safety Commission, out of 30,797 traffic fatalities in 2009, 21 involved a school bus, 13 of which were caused by the bus driver slamming into pedestrians. Because bus drivers, and not regular drivers, are more of a threat, why isn’t the Legislature passing a new law that focuses on bus drivers? Because you’re more likely to be killed by an insect bite than a school bus. And also because monitoring bus drivers won’t result in millions of dollars in profits. All camera tickets are handled in civil court. What that means is, if you are one of the 28 percent of ticket recipients who receives a ticket in error, you have no right to a legal defense. You are forced to defend yourself against billion dollar corporations and local government agencies without the right to legal representation. With red-light cameras and speed cameras in cities, laws require prominent signs to alert drivers that they are being photographed for ticketing purposes. No such notice or signage is part of the proposed law on school bus ticketing cameras. Why? Because warning drivers would decrease profits. After watching how manipulative, brazen and dishonest the for-profit camera corporations and politicians have been with automatic ticketing cameras, my wife Tiffany and I started the website BanCams.com. We saw that no one was representing the people when the corporate-government alliance was splitting the profits from automatic ticketing cameras. We co-sponsored last year’s Mukilteo initiative and are co-sponsoring public votes on ticketing cameras with local initiatives in Monroe, Longview, Bellingham and Wenatchee this year. Time and again, when voters hear the pros and cons of ticketing cameras, they say no to this Big Brother, profit-making scheme. Amazingly, after the 71 percent vote in Mukilteo in November, we expected Olympia to respond. They did, but instead of listening to the people and reining in ticketing cameras, politicians are shamefully pushing bills to expand them! For-profit camera corporations prey on cash-strapped cities and now school districts, promising millions of dollars in “easy money.” But the only way automatic ticketing cameras work profitably is when the deck is stacked, people don’t understand the rules, due process is eroded, safety is ignored, and the people are assumed guilty until proving their innocence. It’s a transparent scam and the people are rejecting it. Never forget that ticketing cameras can’t stop motorists from breaking the law, they can only mail them a ticket weeks later. Senate Bill 5540 and its expansion of automatic ticketing cameras is just another scheme for the politicians to pick the taxpayers’ pockets. Saying it’s for the kids is just blatant deceit and manipulation and it insults the intelligence of the people. Putting a profit motive on law enforcement is extremely dangerous and violates basic constitutional rights and civil liberties. It’s a Pandora’s box that should never have been opened. The last thing the Legislature should be doing is expanding the use of automatic ticketing cameras right after voters emphatically rejected them.